Zircon sand processing method varies with zircon deposit conditions, the introduction of common zircon sand processing as below. Zirconium sand, also known as zircon sand, is a mineral composed mainly of zirconium silicate. Pure zircon sands are colorless transparent crystals, which are often dyed yellow, orange, red and brown due to different origins and impurities. The crystalline structure belongs to the tetragonal crystalline system. The crystalline structure is tetragonal cone-columnar with a specific gravity of 4.6-4.71. The refractive index is 7~8, and the refractive index is between 1.3 and 2.0. The melting point fluctuates at 2190~2420 C with the impurity. Zircon is a mineral consisting mainly of zirconium, silicon and oxygen crystallized from magma during igneous rock formation. Zircon is also found in dikes and metamorphic rocks. It is a tetragonal system and is usually well-developed pyramidal small tetragonal cylinder and irregular granular. Crispy and factoid. It is a high-quality refractory material. Most of them coexist with ilmenite, rutile, monazite and yttrium phosphate rock in seashore sand and are obtained by water separation, electric separation and magnetic separation. The regional distribution of zirconium reserves is highly concentrated, and the zirconium reserves are mainly distributed in Australia, South Africa and other countries, and the distribution is highly concentrated. From the perspective of regional distribution of zirconium resources, the world zirconium reserves are mainly in the hands of Australia, South Africa, Ukraine, India and Brazil. Five countries occupy 86%of the world’s zirconium resources, and the resource monopoly is very obvious. According to the US Geological Survey, China’s zirconium ore reserves are only 500 thousand tons, accounting for less than 1%of the world’s Zirconium resources. Output growth is moving steadily, and supply structure is changing. Zircon sand is extremely resistant to high temperature with a melting point of 2750 degrees Celsius. And acid corrosion resistance.80%of the world is directly used in casting industry, ceramics, glass industry and refractories. A small amount is used in ferroalloys, pharmaceuticals, paints, tanning, abrasives, chemical and nuclear industries. A very small amount of used for smelting zirconium. High-quality zircon and other adhesives together have good adhesion and are used in the foundry industry. Zircon sand is also used as a brick for glass kilns. Zircon sand and zircon powder are mixed with other refractory materials for other uses. Zirconium in metallic form is mainly used in the chemical and nuclear reactor industries, as well as in other industries requiring corrosion resistance, high-temperature resistance, special fusion properties or the absorption of special neutrons. In the United States, about 8%of the total consumption of zirconium is used in these industries, and the only meaningful application of hafnium metal is in Naval Nuclear reactors. Zircon sand processing plant is the process of removing impurities from zircon ores and increasing zircon content. Zircon(also known as zirconium)is zirconium orthosilicate. Its chemical formula is ZrSiO4.It is one of the most common zirconium-bearing minerals. The zircon ore deposits are mostly seashore placer deposits. Heavy minerals such as magnetite, ilmenite, rutile and monazite are usually associated in zircon-bearing sands. In general, the heavy minerals are recycled as the target minerals when the zircon is selected. Gravity separation, magnetic separation, electrostatic separation and flotation are often used in the zircon sand processing plant. Gravity separation. Zircon occurs in ilmenite and often accompanied by hematite, chromite and garnet and other heavy minerals. Therefore, in the initial stage of zircon enrichment, gravity separation is often used, such as shaking table to separate heavy minerals from gangue(quartz, feldspar, biotite)and other heavy minerals. Flotation: commonly used collectors are fatty acids(oleic acid, sodium oleate), the slurry regulator is sodium carbonate, the inhibitor is sodium silicate, the activator is sodium sulfide and heavy metal salts(zirconium chloride, ferric chloride). Oxalic acid is also used to adjust the pulp to acid and flotation with amine collectors. Electrostatic separation: The conductive minerals, such as ilmenite, hematite, chromite, cassiterite and rutile, are separated from the non-conductive minerals such as zircon, monazite, garnet and apatite by using the difference of conductivity of minerals. Before deselect, desliming, drying and dosing should be done. Magnetic separation: Heavy minerals in the magnetic minerals are ilmenite, hematite, chromite, garnet, biotite, monazite and so on. Zircon is a non-magnetic mineral or a weakly magnetic mineral. Magnetic separation is divided into two types: dry type and wet type. Dry magnetic separation must be preheated before drying and grading. The wet magnetic separator has a wide particle size and a lower particle size of 20um. Therefore, when the zircon particle size is fine, the wet magnetic separator is more suitable. Because there are many associated minerals in zircon sand, it is necessary to combine gravity separation, magnetic separation, flotation and electrostatic separation. The zircon sand concentrator is often divided into two parts: wet treatment and dry treatment. In the wet treatment stage, gangue minerals such as quartz, feldspar and mica are removed by gravity separation equipment such as cone concentrator, spiral concentrator, shaker or jig. The heavy minerals(crude concentrate)obtained are further separated by 2-4 stages of concentrating to remove the remaining light minerals, and then concentrated, dehydrated, dried, cooled and sent to dry treatment stage for further separation. Dry processing section is generally made up of weak magnetic separation, high-intensity magnetic separation and electrostatic separation. The aim is to recover magnetite, ilmenite, rutile and monazite which are associated with zircon. Magnetite can be recovered by weak magnetic separation, ilmenite and garnet can be recovered by strong magnetic separation, and monazite, rutile and zircon can be separated by high voltage electrostatic separator. The Hainan Wanning County, China’s zircon sand concentrator deals with the seashore placer containing zircon. The main useful minerals are ilmenite and zircon, followed by monazite, rutile, magnetite, cassiterite and trace gold. Zircon content is about 4%. Gangue minerals are mainly quartz and contain a small amount of feldspar and mica. The combined process of magnetic separation, electric separation and gravity separation is used to recover zircon from tailings of ilmenite. The Kaipel Concentration Plant of Australia West Australia placer company deals with seashore placer. The heavy mineral content of raw ore is 12%-15%, of which ilmenite accounts for 75%, ilmenite and zircon account for 10%, rutile account for 1%, monazite account for 0.5%. The two parts of the plant are wet separation plant and dry concentration plant. The wet concentrator is located on a floating ship. The raw ore is first screened to remove the waste rock, then dehydrated, desliming and fed into a conical concentrator for coarse separation. Because ilmenite is the main useful mineral in the coarse concentrate, ilmenite is first selected by dry magnetic separator when entering the concentrate stage. After titanium separation, the material is separated by a spiral concentrator, and light minerals are further discharged. After drying, the materials are electrically, magnetically and gravitatively separated, and the products such as monazite, zircon and dolomite are selected. 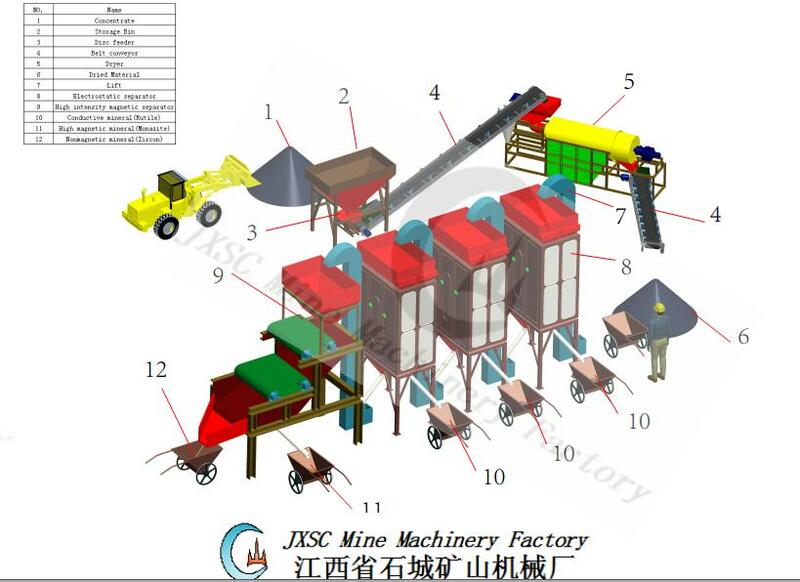 JXSC mine machinery Company in China has more than 30 years professional experience at zircon sand processing, design full set zircon sand separation plant flowchart, provides complete set zircon sand mining equipment, can send an engineer to mine site for zircon sand processing machines installation and commissioning guidance. 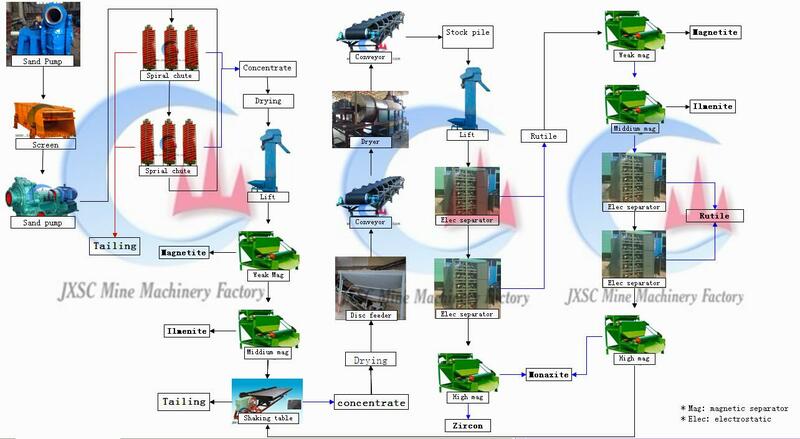 Description of zircon sand processing methods, mineral sand mining machines, JXSC provides a full of mining machines for various mineral ore, stone crushers, gold wash plant, jig concentrator, and so on. Related mining cases: rock gold process, tin ore extraction, coltan mining.